This is a Zilog Z-80 based machine. This object comprises the following parts:. 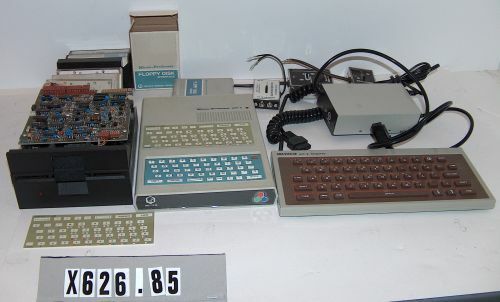 System unit with integral "chiclet" keyboard. Floppy Disk Interface cartridge plugs to side of system unit, in original cardboard box with $90 pricetag. A/C power adapter with unique cable matching system unit. External "MPF-II Keyboard", standard size keys (but still rubber "chiclets"), with cable matching to system unit port on left side. External 5-in diskette drive, would require unique cable to mate to the "Floppy Disk Interface" above, but no cable included. Two copies of a plastic keyboard reference card showing layout of keys for graphic use. Three different TV adapters.